Inder Loves Folk Art: Help with spider identification? Speaking of our garden, check out this guy/gal! 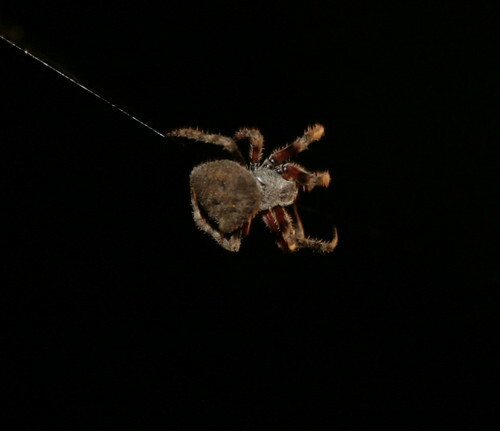 Steve discovered him/her when he walked into his/her web the other night. After wiping web out of his hair, he looked up, and ... WHOA. It's about two or three inches across (including legs), which is probably nothing for you Australian readers, but for our area: freakishly big. We did a little internet searching using highly technical terms like "Big Furry Brown Spider Northern California" and came up with nothing. We don't know what type of spider this is. It's big. It's furry. It has a large and somewhat odd-shaped abdomen. It makes big webs between our gutters and the side of the house (i.e., it does not burrow like a tarantula). If you're still reading and haven't immediately skipped to "next item" on your reader or run squealing from your laptop, you probably know more about spiders than I do. What is this? Another European invasive, this spider can become quite imposing in size and density in the late fall. Makes a large vertical orb-web." Also I HIGHLY object to the tag "gross stuff". Hmph! Okay, see, I would agree 100%, except that in our google searching on garden spiders, we didn't see anything with that shape of abdomen. Maybe the spider's pregnant? She seems to rather bulge out the side. "Gross stuff" was used to describe the terrible "Grain Moth Infestation of 2007." So it seemed only right ... but don't worry, we have a quite friendly relationship with Ms. or Mr. Spider. Yeah, we actually looked at your friend's website and description! But it just didn't seem quite right - that spider seems prickly; ours seems furry. That spider has a nice big round abdomen; ours' is wider, fatter, and strangely unsymmetrical (perhaps because of pregnancy). So yeah, I agree that seems the most likely possibility (insert bit about zebras here), but it just didn't seem quite right. I don't think it's actually asymmetrical - just looks like it's flexed a bit and we're seeing it partly rotated from the side. It's unlikely you'll find a photo of a spider that looks exactly like yours - there's too much variation within the species. The general body plan and color, combined with where you found it + the likelihood of seeing it there, make it most likely a garden spider. But if you're feeling unsatisfied, you can send a photo to a *real* spider biologist (like Steve) and ask their opinion. I'm just an amateur! it looks a leeetle bit like what we here would call a Golden Orb spider. They make big webs (that look golden in the light) and amazingly put them up every night and take them down every day. The effort! The webs are quite strong. I think 'Golden Orb' makes them sound rather lovely, like a resident of Narnia rather than a Stephen King novel. "Golden Orb" does sound very romantic! Not at all like something you would freak out to find in your bedroom, hee hee. We were checking him/her out again last night, and he/she still has a very asymmetrical abdomen (it's not just in the photo, Anne - you should come over and check him/her out in person!) but I'm thinking he/she is just a little funny-shaped. :-) Hey, we all have our "issues," right? It is "quite imposing in size and density." And its web is pretty amazing too - it stretches from our tree to the side of the house, and extends down on the diagonal almost to the base of the rain spout. It's probably eight feet across at its widest point. I'm trying to give it a wide berth because it's pretty cool.